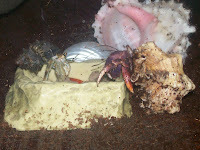 Not too much to say, but I just found out that my crabs are in love with ground turkey. I had a feast last night in my food dish. I used regular ground turkey and I seasoned it with my own set of crabby seasoning (a mix of dried basil, dried celery leaf, dried green leaf lettuce, and dried radish leaf). They went nuts for it! Or should I say gobbles? So, what is it that makes the crabs go crazy over turkey? Maybe it is the great smell or the loads of protein. Or maybe it is something connected to the wild like when the hermits get to eat dead seagull, which is a common dish of carrion for the crabs. Pictured to the top is Kilimanjaro in a native cancellaria shell and Mako in an Apple Murex. I would definately recommend feeding turkey to the crabs because it is a natural source of protein that hermits really seem to enjoy. 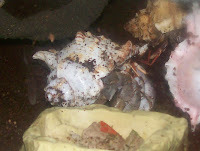 Protein is very important in a hermit crabs diet and is sometimes left out. Pictured top is my Viola, Ryukyu, getting ready to eat some of the delicious ground turkey. That's all for today's post, keep checking up here! Also, I think I am going to start adding pictures to the posts. It seems to make them more attractive to read.